Mini Pumpkin Pies are perfect when you want to have several desserts and make sure everyone can try them all! Easy, Adorable, and Yummy! 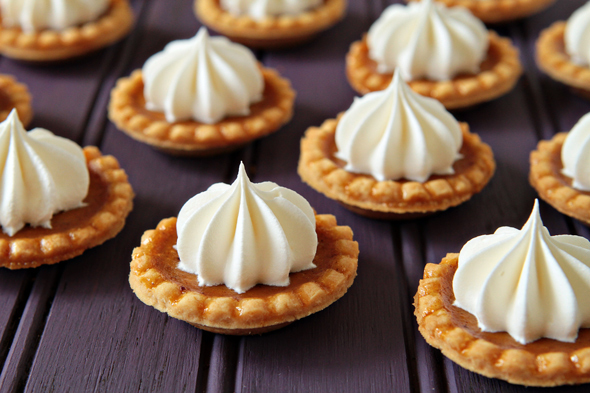 Everything is cuter in miniature and with these mini pumpkin pies you will not fall behind. These are so charming and easy to make. See how quick they come together in this impossibly easy to follow recipe. 48 1.75-inch pre-made miniature tart shells. 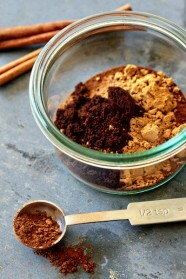 1 1/2 teaspoons homemade pumpkin pie spice (recipe below). 1 cup pure pumpkin puree. 1 teaspoon pure vanilla extract. 1 5-ounce can evaporated milk (this is the small can). whipped cream or Cool Whip, optional garnish. In a medium bowl with an electric hand mixer, combine sugar, salt, pumpkin pie spice, egg, pumpkin, vanilla,and evaporated milk. Beat until well combined and smooth. Line mini tart shells on prepared baking sheet. Using a small cookie scoop (2 teaspoons), fill each mini tart shell with pumpkin pie filling. Carefully transfer pan to preheated oven and bake for 15-17 minutes or until shells are golden and the filling appears to be set. Carefully remove mini pumpkin pies to a cooling rack. If desired, top with freshly whipped cream or Cool Whip. Combine spices in a small bow, mix well to combine. Store in a small jar or spice container. See more delicious recipes here. Apple-Themed Wedding Ideas – Perfect for a Fall Wedding! Frosted Shot Glasses Wedding Favors – Meet Our Newest Addition!